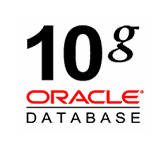 Oracle 10g is a updated version of the Oracle Database. Here the term G stands for”grid" to indicate that 10g is "grid-computing ready" Oracle is a high-security Internet platform to manage enterprise applications, web sites, Java programs and Internet files etc. This tutorial is designed for oracle professionals is tutorial prepares the Oracle Database 10g Express Edition Developer to perform common development and administrative tasks of Oracle Database 10g Express Edition. To learn this tutorial one must have basic knowledge of Oracle concepts and after completing this course one cam become expertise in Use Oracle 10g effectively.